All of us have lathes, or would like to have them, and although much has been written about their use, most of it is theoretical stuff of little practical value. I have long felt the urge to give some hints and advice on the art of turning, most of which I have acquired the hard way. Many of our readers will wake up on Christmas morning apparently paralysed from the knees down. After struggling vainly for a few minutes, they will realise that this is not due to any overnight affliction. but is caused by a huge packing case delicately poised across the foot of the bed. Closer examination will reveal that this packing case contains a brand new Myford Super 7, complete with powerful motor and all accessories, a present from their loving wives, in return for the pair of seamless nylons which they hurriedly bought at about a quarter-past ten the previous evening. These people can get cracking right away, but some of us are less fortunate, and may have to make do with a second-hand machine; so let us consider what the lathe is and what to look for when purchasing one. Basically, a lathe consists of a roughly shaped block of metal known as the bed to which all the other bits are attached. Some of the bits should be fixed firmly, others may be slid about, and it is most important to choose a lathe which has the right bits fixed and the right bits left loose. The bed is usually decorated with a tasteful pattern of hammer-marks, saw-cuts and drill holes, and quite a lot may be deduced about the character of the previous owner by a close examination of his lathe bed. A bed covered with a network of tiny saw-cuts and holes shows that he was a niggling, fiddly, spectacles-on-end-of-nose type, probably addicted to making models of bicycles one hundredth full size complete with working roller chain. On the other hand, if the bed is entirely covered with masses of huge dents and hammer blows at least a quarter-of-an-inch deep, that is a sure sign he was one of the jolly, swashbuckling, have-a-bash-even-if-it-kills-me chaps. To get back to the lathe, you may find it has what is known as a gap bed. This means it has a recess at one end which is very useful, as cups of tea may be placed there without disturbing the work in progress. The next two most important parts, the headstock and the tailstock, will be found one at each end of the bed. Lathes which have them both at the same end should be instantly rejected. They are quite useless to the model engineer, who is rarely called upon to machine a job which has its opposite faces on the same side. The head-stock may contain bearings, and if so they should be examined very carefully before buying the lathe. Insert the tips of the fingers in the annular space between the mandrel and the part it turns round in, and cautiously feel round. Things to look for are odd pieces of brass, bent coins. compressed milk-bottle-tops and anything else that may have been hurriedly crammed in to act as packing. If the lathe should have split bearings, there is no need to worry unduly; they can easily be welded up. In theory, the headstock and tailstock should point straight at each other, but in the author's experience this does not happen very often. The best way to check it is to insert the lathe centres and then bring the tailstock up towards the headstock. The points will probably have nothing to do with each other at all; if this is the case, take them out and replace them with the blunt end outwards, If they still miss each other, it is very doubtful whether the machine is capable of turning out any really accurate work. Of course, you can make a lathe; the only snag is that before you can do this you must first obtain another lathe to make it on. All lathes have to be made on other lathes. How the first lathe was made is one of the great unsolved mysteries of engineering, like how they built the pyramids. Before describing any actual turning operations, some mention must be made of chucks and lathe tools. Chucks are the things which lathes are invariably supplied without. You can buy a lathe without a 3-jaw chuck or one without a 4-jaw chuck, but if you can afford it get one without both, they are really indispensable. This also applies to lathe tools. These are the bits which actually do things to the lump of metal you are turning, so it is no use starting without a large supply of them, and they must be correctly ground and inserted in the toolpost, one at a time, with the sharp end to the middle. A few of the more useful shapes are shown in Fig. 1. A and B are right- and left-handed digging-in tools. They are usually used for the first carefree assault on the work in hand. C is a roundnosed smooger, used for removing some of the horrible grooves and gashes made by the digging-in tool. D is a tool of the author's own design; it is intended for cutting right- and left-handed threads simultaneously. E is a profile or form tool. This is extremely useful if you should ever happen to want to turn something shaped like F, otherwise it is a total loss. If you can afford them, it is a good idea to buy some tipped tools. The body of these is formed of steel, but the actual cutting edge is a tiny bit of some very hard substance, such as household coal, and their chief merit is that they may be run frequently into the revolving chuck-jaws without damage. A good tipped tool will completely remove nine or ten sets of chuck jaws before it even needs touching up. Some turners keep their machines submerged in a revolting fluid known as cutting oil or coolant, the real purpose of which is to dissolve the swarf as fast as it is formed, and so save a lot of tiresome sweeping up. It can be obtained in little bottles, or a handy mixture may be made at home by taking an old earthenware pot and putting in 2 quarts of phosphoric acid, 4 gallons of corrosive sublimate .B.P., 3 pounds of used gear-box sludge, and boiling together for eight hours. Throw in a handful of silica carbide and allow to seethe. Up to one per cent, of aromatic oil of cloves may be added, if liked. A copious supply of this liquid squirted on to the work will completely eliminate the swarf. It should first be diluted with old tea, otherwise there is a grave danger that it will completely eliminate the lathe as well. It should not be drunk. We will assume that we have now got our lathe, tools and equipment and are ready to start work, so let us take some simple job and follow it through stage by stage. A very dear friend, we will suppose, has begged us to make him a new thrupple nut for his lawn mower, to replace one damaged by running into a mangle hidden in the grass. First of all we take up the old thrupple nut and try to imagine what it must have looked like before the accident, then, seizing a pencil, we carefully draw it out full size (Fig. 2). Next, we obtain a piece of Admiralty bronze, an inch or two larger in all directions than the finished nut, to allow for any small errors, and grip it firmly in the chuck. We clamp a suitable tool in the toolpost, set the lathe in motion and our big moment has come at last. We are about to take our first cut We shall now see a practical realisation of that ancient problems first posed by Archimedes one night while waiting for his bath to fill, namely, what happens when an immovable object meets an irresistible force. Grasp a handle-any handle will do to start with-and turn it rapidly. If nothing much happens, try turning it the other way. Turn another handle. Turn all the handles in sight. If you can seize a handle with each hand and turn them both at once in opposite directions so much the better, this looks really professional. Keep spinning them round; sooner or later the tool is bound to run into the revolving metal, and you will actually have started turning. Ease up a bit on the handles then and watch carefully what happens. If the metal peels off in great thick red-hot chunks, with a good deal of smoke, you are taking too much off at one go. On the other hand, if the metal merely becomes highly polished without getting any smaller, you have probably got the tool in upside down. Rectify these errors and keep hacking away until the piece of metal is tortured into a shape which looks vaguely like the drawing. If it obstinately refuses to do this, the only thing to do is to make another drawing which looks vaguely like the piece of metal. We are now ready to attempt the next operation, which is screwcutting. h.t.l.b. high tide at London Bridge. Thus, we need to put a 273 tooth wheel on the mandrel and a 1 ½ tooth wheel on the leadscrew. If you haven't got a wheel with 273 teeth, you can use one with 275, simply take a hammer and chisel and knock off any two. Readers who do not possess a 1 ½ tooth wheel either are certainly in a bad way; they should write to me personally, as I have many wheels with l½ teeth, or even fewer. Once you have got the right wheels fitted, the actual screwcutting operation is quite easy. Simply put a sharply pointed tool in the lathe, and let it plough its way along. Do not worry about it going too far along the work; as the tool reaches the shoulder it will automatically snap off. Having finished screwcutting our thrupple nut, all that remains to be done is to part it off, and believe me, this is where we are really up against it. Trouble looms; parting off is so fraught with peril, and the chances of success are so remote, that it is really better not to attempt it at all. Of course it is rather awkward when you have turned, say, a pair of steam-chests, a thrupple nut or two, an ornamental candle snuffer, and a couple of feed-pumps, to have them permanently joined together like a small totem pole. it rather limits their usefulness, so for the benefit of our braver readers I will describe how the job should be done. First, you must make a parting-off tool. Obtain a piece of tool-steel about ½ in. square and 4 in. long, and press one side of it up against a grinding wheel for about five days, renewing the wheel when necessary. At the end of this time, the tool will be reduced to a long thin blade. Just as you are giving a final touch of keenness to the cutting edge the whole thing will suddenly become red-hot, which makes it quite useless; throw it away, and go out and buy a proper one. Clamp it in the toolpost, set the lathe going, and advance the tool briskly into the work. Don't be intimidated by it, use a quick jabbing action, and as long as you stand well back to avoid the flying fragments of parting off tool, you will probably not be much injured. The thrupple nut will now have a cross-section like a lop-sided figure eight, so you will have to throw it away, and turn up another one. This time we will try parting it off in the traditional manner, with a hacksaw. Even this is not all plain sailing. You will think it is at first, but when you get three-quarters of the way through, a most surprising thing will happen. There will be a loud bang, and you will be thrown on to the revolving chuck, probably with the loss of three or four teeth, and when you recover consciousness, the thrupple nut will have completely disappeared. You can sift through every particle of swarf, examine every inch of the floor through a magnifying glass, search in the most unlikely places, you will never find it. Your thrupple nut has gone forever. 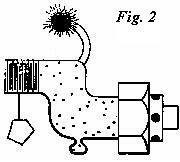 I have a theory that when the diameter is reduced to a point where its periodic vibrations coincide with the nodal points of the hacksaw blade, the molecules of the metal actually pass through each other, thus forming Ughium, which is of course a gas. This remains to be proved. (b) H-shaped things, like television aerials. (c) Complicated things, e.g., a scale model of Wimbledon made in basic slag. Would any reader care to buy a good second-hand lathe, with all accessories and 49 gross of half finished thrupple nuts ? I am reluctant to part with this unique and valuable machine, which is by Holtspiffle, but the floor space is urgently needed. I am going to build an electronic organ.